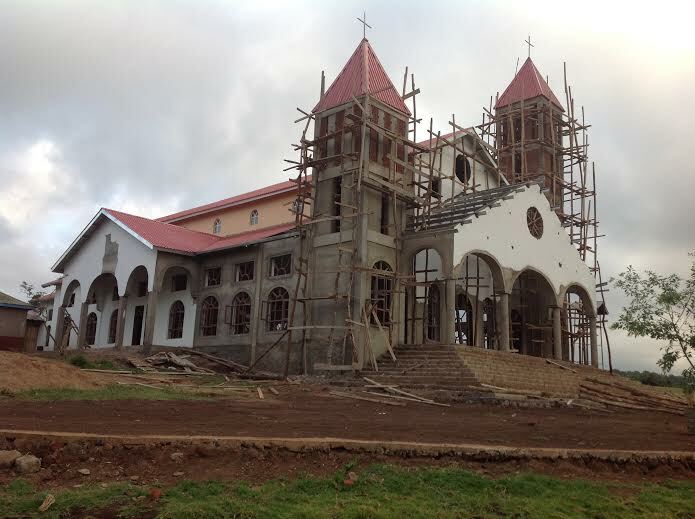 Earlier this year, donors generously agreed to support the construction of the new St. BrendanParish Church in Kitete, Tanzania. With the construction now complete, we'rehonored toextend to donors a heartfelt "Thank you!" In October, St. Brendan's Parish celebrated its 50th anniversary as a parish and as youmay recall, St. Brendan's parishioners wished to celebrate this anniversary by building anew church, at an estimated cost of $170,000. Though poverty is characteristic of theparishioners, who have an average income of only $400 per year, many pledged $37 perfamily to raise nearly $80,000. They also donated materials and countless hours of labor.Even with this momentous show of faith and sacrificial giving, they were still going to fallshort of their goal. That is, until news of their commitment and determination reached afamily here in the states. The family offered a $30,000 matching grant to encourage otherUnited States Catholics to assist St. Brendan's. The Holy Cross District of East Africa and United States Province of Priests and Brothers, ofwhich Holy Cross St. Brendan is an apostolate, thank you for helping build God's Kingdomthroughout the world. The Jubilee celebration was beautiful and colorful. 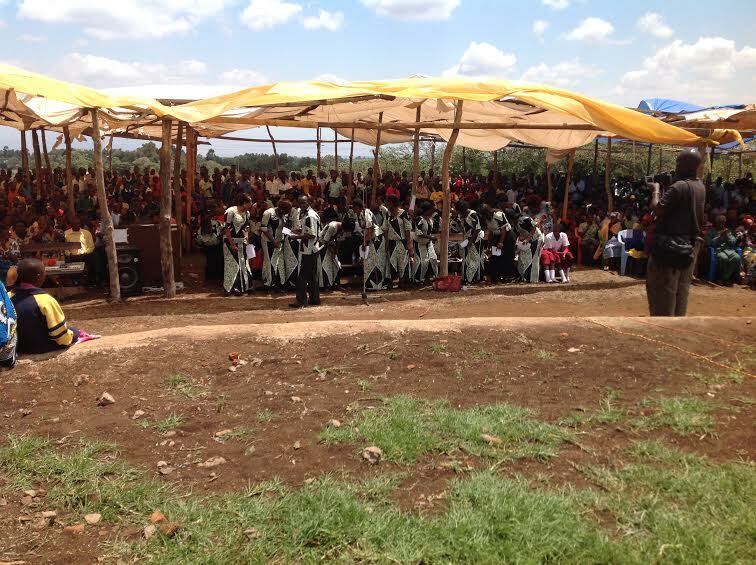 The celebrations started on 23rdOctober with our visitors from Holy Cross Parish, Dandora, Nairobi, Kenya. They arrivedin the evening and we had supper and social together. They were so happy to see ourParish and our new, big church. More than 80 people from Dandora joined us,including Holy Cross Priests, brothers and seminarians, as well as some diocesanpriests. Among the Holy Cross religious were: Fr. Pat Neary, (District Superior), Fr.Comfort Agele, Fr. Andrew Massawe, Fr. Changwe Constantine, Fr. ChristopherLetichrich, and Fr. Agapitus Mugabane. It was an event that brought us together andenabled us to share time together as a family of God. The following day, we started our Jubilee day celebrations with Holy mass, presidedover by Rt. Rev. 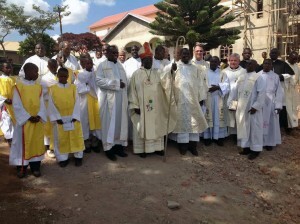 Bishop Beatus Kinyaiya, the Bishop of Mbulu Diocese. The mass wasso colorful and gilded in song by our Parish Jubilee choir and Dandora Parish Choir.Many diocesan priests and religious were in attendance. 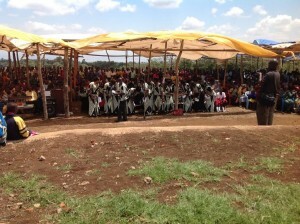 In total, more than 4,000Christians attended. As usual, cows, goats and chickens were slaughtered for the day. Everyone enjoyed themeals and were satisfied. After, we had entertainment to close out our big day. Wemissed you so much at this big and historical occasion for our parish. We believe,however, that your prayers were with us and you were here with us in spirit.The big mark for our Jubilee celebration was the NEW CHURCH. As seen from thephotos, we could not finish everything we wanted to accomplish before the Jubilee day,simply because of the short timeframe we had. I was so grateful that most of the churchroof was on and the majority of it plastered. We also managed to put in window anddoor frames, paint, and put glass in some areas. Overall, our church looks beautiful andwe are continuing to complete parts that were left unfinished before Jubilee day. Thebiggest task ahead of us now is to look for ways to tile the floor and purchase doors andglasses, paint, and church pews (desks). Last week, at our committee meeting, weagreed that some of these needs should be met before Christmas celebrations. 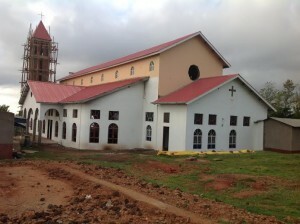 It wassuggested that dedication of the new church be done in February 2015. We are so grateful to God for the many blessings we have received in our parish. Wealso sincerely appreciate the love and support we have received from many of ourfriends in the United States. Thank you all for such great love and support you havegiven to our Parish. We remember you and pray for you always. I wish you all the best and may God bless you and all that you are doing!